Small business in America is defined as anything under about 500 employees. For most people there might as well be a sub-categorization of “Smaller Business”. We always ask what your goals are first, then design around that. Not the other way around like most everyone else. We even write complete strategy guides for our small business clients. Just so you know what we’re seeing, what we’re working toward, and how to get more leads, grow sales, or expand your business. A business that isn’t growing is a business that’s starving, and we’re here to help. 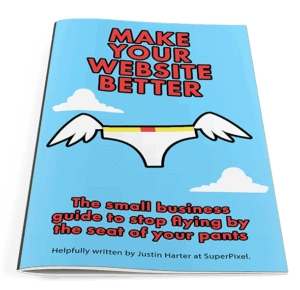 A small business’s guide to a better website. Stop flying by the seat of your pants! It’s why we started our Smaller Business Podcast series and wrote the book on building a better small business online. What’s included in this small business guide to a better website? A checklist of top to-dos to get you started. To get your free copy, just fill out this handy form and you’ll be directed to a PDF version. And no, we won’t spam you. In 2015 we sent out two emails. Wondering how much hiring us costs? We have the simplest pricing of anyone. Can you help us manage our social media presence? Yes, and we do that across all sorts of sites and for all sorts of organizations. We don’t chase followers and “likes”, but we can give you ideas or do it for you. What about SEO (Search Engine Optimization)? All of our sites are built to standards and best practices established by Google and other search engines. We can’t ever guarantee anyone any spot in a search result, but we can set some goals and implement a strategy to get there. I already have a website, can you maintain it? Possibly, but not likely. Most of the time when someone says this they really have an old site from ten years prior. It doesn’t do anyone any favors to keep that around. It’s like driving cross-country in a 20 year old car. Maybe you’ll get there, but you can’t be surprised when it leaks oil along the way. What other stuff do you do besides websites? We can help with photography, video production, email campaigns, writing, and printed materials like signs and banners. Can’t I just do something for free with Wix or some other free site builder? Probably, but just like do-it-yourself plumbing or car repair, you get what you pay for. You should read a little more about free site builders on our blog. This is an investment in your organization just like your cell phone plan and your business cards. In many cases, your site is the first and only thing people will see about your group or organization. It’s worth spending a little money on, and we work hard to keep our costs down so we can pass those savings on to you. How long will it take to make my website? Assuming this is a “typical” site with a handful of pages, you’ve got your content mostly ready to go, or if we’re redesigning an existing site, it’ll probably take us two or three months. Larger sites, such as e-commerce sites and anything with a lot of information to sort through will take longer. If you work at an organization that requires many stakeholders and the process just has to move slower, so will we, and that’s okay. A clear and direct cost that’s the most affordable in the industry. Fast, concise communication before, during, and after your site is up and running, with automated emails tracking the status of your site or project as it’s built. A focus on getting you the best possible search engine rankings imaginable, organically and without black hat SEO practices, to help you gain a bigger audience. Help writing and putting together grants and web content, including our Content Review process. We can even help you put together a social media and marketing strategy to help you garner attention online and grow customers organically.